I know for most people, it seems ludicrous that the mountain bike race season starts as early as February. With ‘cross Nationals in January, February seems like a good time to take a break, maybe put the bike away, and get out into the snow to carve some turns. But the snow in the PNW this year was a dud. The east coast may still be digging themselves out of feet and feet of snow, but it’s been almost balmy in Seattle, and the dirt has been great for riding. It was my plan from the beginning to jump on the first race of the season, knowing that my culminating race for 2015 is in July, the High Cascades 100. I wanted to start early to get my race legs under me again. 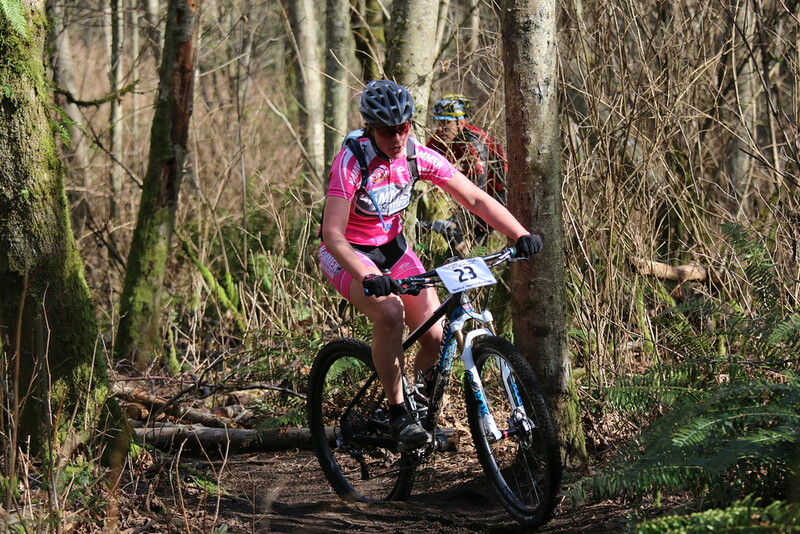 The race was at Dash Point State Park, near Federal Way, WA. With only about 10 miles of single track, it’s not a venue that I’d consider a riding destination, but it offers fun terrain for an XC race. Since the women’s fields were relatively small, they started all Expert women together in an unorganized cluster, regardless of category. I only had about 300 feet of fire road before the steep pitch of single track, so I knew I had to sprint for it off the start line. I just barely edged out the woman next to me to enter the single track first. But then I quickly opened up a gap when a small crash ensued behind me at the base of the punchy, loose climb. I kept out front for most of the first lap, but then a girl, half my age, breezed past me on a straightaway. I was never able to catch her, but I had a great race with two other women, each of us taking turns in the lead spot. I was stronger on the climbs, my legs free from the typical lactic acid burn I used to experience, before I discovered Race Caps Supreme and Endurolytes. About 45 minutes into the race, I ate a Chocolate Hammer Gel, just the right amount of fuel to allow me to keep the gas on the pedals without waning, through the 1 hr, 10 minute race. Since the categories were mixed, none of us knew for sure how we did. Once the results were posted and the podium called, I was thrilled to have the confirmation that I took 1st in my category and 2nd woman overall. As the first, short, high intensity race of the season, I expected to be crippling sore the days following the race. After the race, I consumed Chocolate Recoverite with half a scoop of Whey Protein, and threw down a few Premium Insurance Caps and Super Antioxidant supplements, and I crossed my fingers and hoped for the best. To my surprise, I didn’t experience the excruciating soreness that I had expected. Usually I get sore a couple of days later, but the post onset muscle soreness never came! I know most people think of Hammer Nutrition as fuel for the endurance athlete, but their products are perfect for shorter efforts too.